In the latest ‘State of the Internet’ report by Akamai, it has been revealed that broadband connectivity in India is improving and expanding at a healthy rate. As per the report, the average Internet connection speed in India is 2 MBPS, which ranks us 115 globally. Although we still behind Asian countries such as Thailand, Indonesia, Philippines and Vietnam, but compared to our historical (and often legendary) speeds, we have improved 15% quarter on quarter and 46% annually. This is excellent development compared to their last report in the month of July; wherein we had shared that Indians access slowest Internet in Asia. 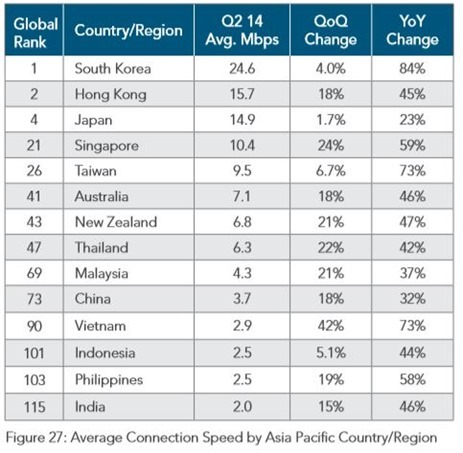 In that report, it was revealed that Internet connection in India is less than one tenth of the speed in South Korea; half of what a Chinese citizen gets and one third of Internet speeds in Thailand and Singapore. One very crucial observation from the latest Akamai report is the rate at which we are expanding: Indian broadband adoption rate has increased 5 times since the second quarter of 2012 and more than 10 times since second quarter of 2011. Expansion of broadband Internet in the 3rd fastest growing economy in Asia is an excellent news for those into technology and Internet niche. More people accessing Internet translates to more customers who need services/products based on the platform. Marketers should especially take note of this development to plan out their long term campaigns. Besides adoption of Internet and average broadband speed, India has also improved in its peak connection speed which is 14.4 MBPS right now; which is an increase of 20% quarter on quarter and 24% for 2014 (as of now). Another good news for Indian internet users: Compared to first quarter of 2014, attacks on Indian IPs have come by 0.5%. China is the country where maximum attacks such as DDoS and SQL Injection happens, followed by Indonesia, US and Taiwan. Within Asia, India was among the top 4 countries where maximum new broadband connections originated. India witnessed 179% increase in new broadband connections this year, compared to last year. Vietnam witnessed maximum increase at 722% year on year. Overall, the improvements made by Indian broadband service providers is less, but the good thing is that, we are both improving and expanding. The report clearly mentions that considering the long term goals and plans, India is doing relatively good compared to other developing countries. On the same hand, a lot has to be achieved before we can truly call ourselves the ‘superpower’ of Internet and Broadband connectivity. You can access the full Akamai’s ‘State of the Internet’ report here. Hi I am located in Rohini , Delhi and I am in the market for a new , reliable , fast but reasonably priced internet connection. Can you reccommend a good one ?